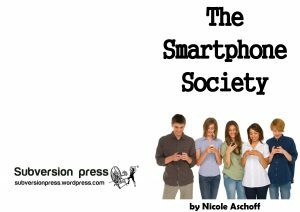 “If you define a cyborg society as one in which human relationships are mediated and shaped by technology, then our society certainly seems to meet this criterion, and our phones play a starring role. But our relationships and rituals have long been mediated by technology. The rise of massive urban centers — hubs of connectivity and innovation — would not have been possible without railroads and cars. do. We make things and use things according to the existing web of social, economic, and political relationships and the balance of power. The smartphone, and the way it shapes and reflects existing social relations, is no more meta-physical than the Ford Rangers that once rolled off the assembly line in Edison, New Jersey. 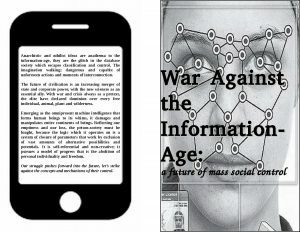 Anarchistic and nihilist ideas are anathema to the information-age, they are the glitch in the database society which escapes classification and control. The imagination walking; dangerous and capable of unforeseen actions and moments of interconnection. The future of civilisation is an increasing merger of state and corporate power, with the new sciences as an essential ally. With war and crisis always as a pretext, the elite have declared dominion over every free individual, animal, plant and wilderness. Emerging as the omnipresent machine intelligence that forms human beings to its whims, it damages and manipulates entire continents of beings. Reflecting our emptiness and our loss, the prison-society must be fought, because the logic which it operates on is a system of closure of parameters that work by exclusion of vast amounts of alternative possibilities andpotentials. It is self-referential and non-creative; it pursues a model of progress that is the abolition of personal individuality and freedom. Our struggle pushes forward into the future, let’s strike against the concepts and mechanisms of their control.